Uganda Here I Come -Well Almost!!!! Sometimes fate steps in, and you just have to throw caution to the wind and say yes. This was one of those wonderful occurrences. A chance Facebook meeting with Sarah Nyamwenge led to an unexpected invitation to come to Kampala, Uganda, to cover the Lady Crane International Fashion Show. Although the 2 week time frame proved too short to get everything in place - I can only offer my deepest thanks to Sarah Nyamwenge who shouldered the biggest burden for trying to make this happen while still dealing with all the myriad of responsibilities for her upcoming event. You can learn more about the amazing Lady Crane event and its equally amazing founder in my interview with Sarah - Shining an International Light on Talented Artists! Although I will not be in the audience this year, all the things that needed to come together on my side were an unexpected journey full of twists and turns. ENJOY! This invitation came on April 11th and I would be leaving Vancouver no later than May 4th. I really had no experience with international travel that required visas, immunizations and more, so had no idea what I needed to accomplish on my end to make it happen. To be totally honest, I was actually clueless, which is a good thing as I might have said no if I knew what I was facing. In the end dumb luck and intuition helped me to accomplish my part. I leave in a few days. So here it is - a breakdown for others facing the same situation. And it all begins with WHY as that is what I am constantly asked. I've had several people ask why, especially given all the bad press Uganda has received in the news lately. The answer is real people. Behind all the headlines are artists and businesses trying to work together to build a community and show the world what they have to offer. I love interviewing, I love hearing unique journeys, I love mentoring, I love giving a voice to those who the media is not listening to - and the list goes on. This trip embraces all I love to do. The fact that Sarah in particular has worked so hard despite all the other things on her plate also touched me deeply. I honestly don't know if I will have any free time while there to explore Kampala, but I embrace this opportunity as it truly feels just right to be going. On return to Vancouver, I will need a few days to recover from the long hours spent traveling both directions before answering questions or attending other events. NO! Traveling smart is true for wherever you travel. And don't let sensational media define where that travel takes you. There are tons of advisories for tourists looking to be informed that you SHOULD access and you have to travel smart. If you don't do that, it doesn't matter where you go, you can have problems. The first thing I did was check the website of the Ugandan Consulate in Vancouver. It said a visa would only take 2-3 days. No worries - lots of time. Well, there was that little inside voice that said I needed to confirm it and that voice was right. Visas actually have to come from the Ugandan High Commission in Ottawa and there is mailing time both ways. You need to provide 2 identical visa applications, get passport photos taken, purchase a money order from the Canada Post in USD and provide a self-addressed return envelope. As time was short - I purchased an Expresspost envelopes for both ways. With USD visa fee and extra postage both directions, this ran me about $100. I thought I did it all right, but my efforts failed. While they stated I must have a valid passport, I input all the data on the application and included a photocopy of it - what they required was for me to send my actual passport as the visa is put inside it. OOPS - my mistake! However, even with the Expresspost envelopes they have not returned my original documents and money order, so perhaps it's all for the best. I couldn't leave the country without my passport. Option B is to purchase the Visa on arrival in Entebbe which I am assured will not be a problem. Much more stressful, but the only option when your trip is planned on the fly. I'll let you know how that goes in a another post. While attending a last minute invitation to a function put on by the Ugandan Consulate in Vancouver, I had someone mention off-hand I could get a speeded up Yellow Fever Immunization. Excuse me? I had no idea what they were talking about. I had originally intended not to start shots until it was all a done deal - but now questioned that decision. First thing the very next morning I called my doctor to book an appointment. I was told she would give me a prescription to pick the needed vaccinations at the pharmacy and then could bring them right back so she could administer them. GREAT! Intuition is a wonderful thing. 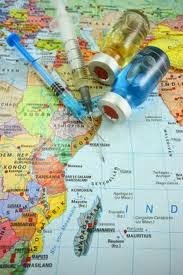 There was a niggling doubt rolling around in my head so I called the London Drugs Pharmacy right next to the clinic and found out Yellow Fever - the most important shot - could only be given in Canada at an official Travel Clinic. It also had to be given a minimum of 10 days before departure or I wouldn't be allowed into the country. WOW! They connected me with the travel clinic nurse who happened to be in that day who - after me literally breaking down into tears on the phone - agreed to stay late. For anyone who feels there isn't great customer service anymore, you are wrong. This lovely woman put in an extra 1-1/2 hours to help me out. In the end this was pricey. I had to have the yellow fever shot (very expensive) and purchase malaria prevention pills to take that cost roughly $5.50 each (best choice is Maloran for those who want to know). They are taken from 2 days before you leave until 7 days after you return, so I had to purchase 16. In addition I had the Hep A and Hep B shots, Typhoid and Tetanus (been over 10 years). On the list also were Ducoral, which helps prevent traveler's diarrhea about 50% of the time and an antibiotic highly recommended to carry with you in case the Ducoral failed. Add in some great bug repellent for those pesky mosquitos and the total cost with taxes came to just over $500. I still need sunscreen! Note - I know others who have paid over $900 for travel immunizations, so be sure and book your appointment early and budget for this cost. Fortunately, many of these are good for a long time, so this becomes easier and cheaper each time. If you book in advance, you can usually find a flight from Vancouver, B.C., to the Entebbe airport just outside of Kampala that takes approximately 24 hours and costs around $2,000. You have to be seriously attentive when choosing a flight as some airlines will want to put you on puddle jumpers that take well over 36 hours in travel with lots of stops and layovers. I do prefer a flight with slightly longer breaks at stops if I have to change planes. It's just so much kinder to one's stress level to know you'll make your connecting flight. So book early, look for a flight you can book all the way through and carefully check layovers to make sure they are not excessively long. A travel specialist can really help in this area. My number one first choice would have been the Speke Resort Munyonyo where the Lady Crane event is being held. It's a beautiful resort and being right at the venue would have made everything simpler and more restful. I think the best choice all around when travelling to areas you are not familiar with - especially if they are off the beaten path - is either get the advice of someone who knows the area, a travel specialist who can check it out for you, or chose higher end accommodations located near where you want to tour. My husband and I usually look for a self-guided tour booker specializing in the part of the world we are visiting who can advise us on the best places to stay depending on services available, what we might want to see and days local attractions are open. Oh my little reliable instamatic camera. You've carried me through so many trips and events with pride. Now on its last legs - the replacement camera I want is on sale in the US, but won't be available in Canada for 4 weeks. SIGH! Time to dust off the old, bulky SLR, put it in Auto mode and make the best of it. Not as easy to travel with, but do-able and great in terms of the actual pics. My other piece of technology will be an old 10 inch laptop. As much as I prefer to write on my 17", it's just too heavy to travel with. So if you see funny misspelling on FB or twitter, just remember I'm typing on a mini keyboard. Don't Forget your power adapter!! Whatever electronics you take with you, you'll most likely need a power adapter. One site told me Uganda was 220 volts, another 240 volts, although they both agreed on 50 MHz. 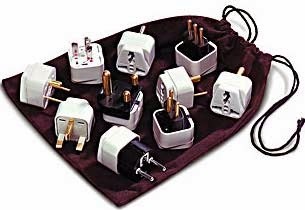 According to The Electrical Outlet which offers an extensive list for most countries, you should bring a Type G Electrical Plug. What a joy to go where you're not one of hundreds in line writing on an event. The rush of bringing attention to rising talent is like none other. While this trip fell through at the last minute due to circumstance beyond the organizer and my control, look for my article on Sarah Nyamwenge in the September issue of Raine Magazine.